The iconic style of our Cambrai Mission Slat Bed will serve as a beautiful centerpiece to your bedroom suite. 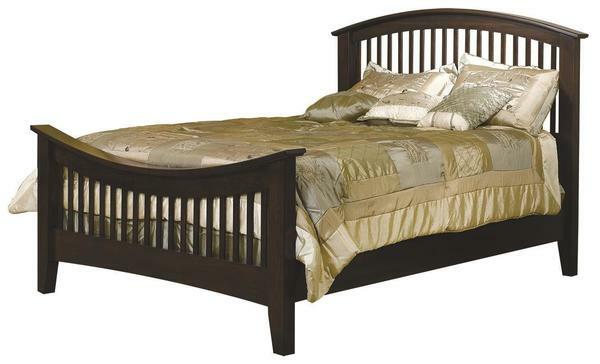 Crafted from solid hardwood, with gently curved headboard and footboard, clean slats, and large legs, this bed is versatile enough for any home, from classically inspired decor to a modern design, and everything in between. The Cambrai Mission Slat Bed is available in all standard sizes, from twin to California king, choose the perfect size for your space. Customize this bed and make it your own by choosing from nine different hardwoods, each with an array of premium stains that are finished with a beautiful conversion varnish, and your need bed will be bench-built, just for you. Each one of our Amish handcrafted beds are finished to an heirloom luster than ensures you can enjoy this bed for a lifetime, and hand it down for generations to come. Call one of our Amish Furniture Specialists today with any questions on the Troyer Ridge Bedroom Collection. Toll-Free (866) 272-6773. We are also easy to reach at our email address, Questions@DutchCrafters.com.